I’ve been dreaming up this recipe in my head for a while. Until now, I had never produced a white or yellow cake that has left me satisfied. Perhaps I can blame it on eating boxed cake mix as a kid, but the homemade recipes I’ve tried were always way too dense for what I wanted. Don’t get me wrong – those cakes have killer flavor. You can really taste the buttery goodness. But, blame it on the box, they were just pound cakes baked in the wrong pan. Sure those cakes would be great for building a cake shaped like a car or rocket ship, but not what I was looking for in a super moist – killer yellow cake. FINALLY I’ve done it. I made this cake for my sister, Marian’s, birthday this past week. 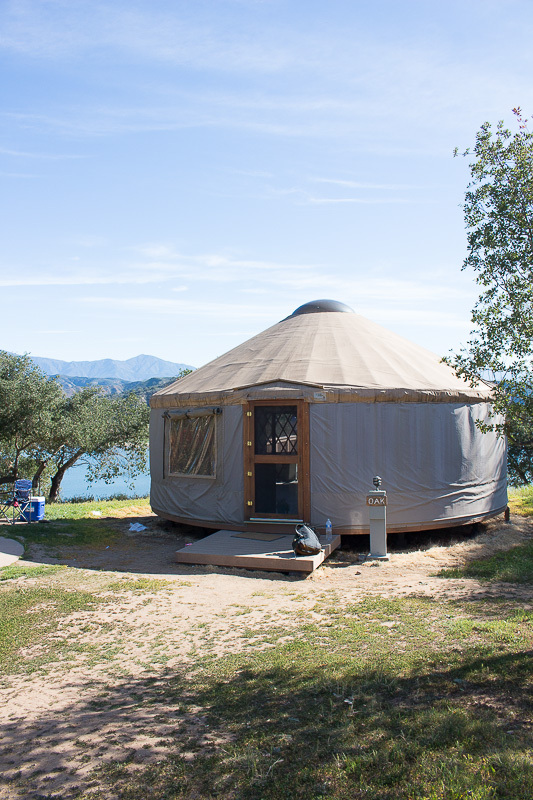 We went glamping in this structure called a “yurt”. 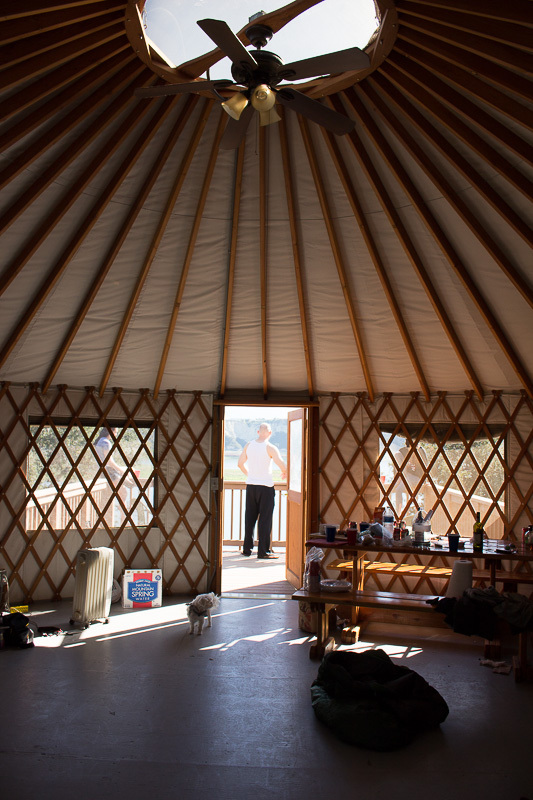 Normally I wouldn’t be down for straight up camping, but the yurt had an outlet, fan, portable heaters, bunk beds, and a clean outhouse that was walking distance from our site. We brought the cake with us in a cooler and everyone was swooning over it. Needless to say, I was incredibly pleased with myself, and you will be too! How beautiful is this inside of this structure? NOTE the cake pictured is made from about 1.5x the recipe. (I also made about 6 cupcakes on the side to be safe). I surprisingly prefer Wilton brand cake pans because they are light weight. My cakes also never stick to the sides (after proper buttering and flouring, of course). But when it comes to tips, I always prefer Ateco over Wilton. Also make sure you use extra large piping bags when frosting cakes, because refilling is such a burden (and typically a mess, as well). This incredibly moist cake paired with the sinful, yet not too sweet, mascarpone frosting will send you straight to cake heaven. (If you would like a lighter and fluffier frosting, use 2 cups of heavy whipping cream instead of 1, and only 8 oz of mascarpone cheese) This frosting recipe makes enough for two cakes, so if not doubling the cake recipe, cut the frosting ingredients by half. In a medium bowl, combined the dry ingredients and mix well. In a separate bowl or measuring cup, melt the butter and let cool slightly (it should still be melted). Then add the oil, buttermilk, water, vinegar and then the eggs. (It is best to combine the ingredients in that order so the butter is guaranteed room temperature so as not to cook the eggs). Distribute between 2, 8 inch cake rounds that have been greased with butter and dusted with flour. Cream the butter, cream cheese, and mascarpone until light and fluffy. Then add the salt and confectioners sugar and mix to combine. In a separate bowl, whip together the heavy whipping cream until stiff peaks form. Make sure not to over mix because it will become grainy and change the texture and appearance of your frosting. Gently fold the whipped cream into the mascarpone cream cheese mixture until fully incorporated. If not using immediately, cover and refrigerate and take out 10 minutes to bring to room temperature before applying to the cake. If making a 4 layer cake: Using a large bread knife, trace the outside of the cake and then slowly saw back and forth through the cake, making sure the knife is as parallel as possible. Pipe or spread a thin layer of icing on top of the berry syrup. Evenly distribute sliced berries on top of the icing layer. Place the second layer of cake on top, and so on. Do not put any berry syrup on the very top layer of the cake, because the frosting is too difficult to spread and your cake will look too crumby. Roughly spread the frosting all over the cake to create a crumb coating. I like to refrigerate or freeze my cake for 10 minutes before proceeding. 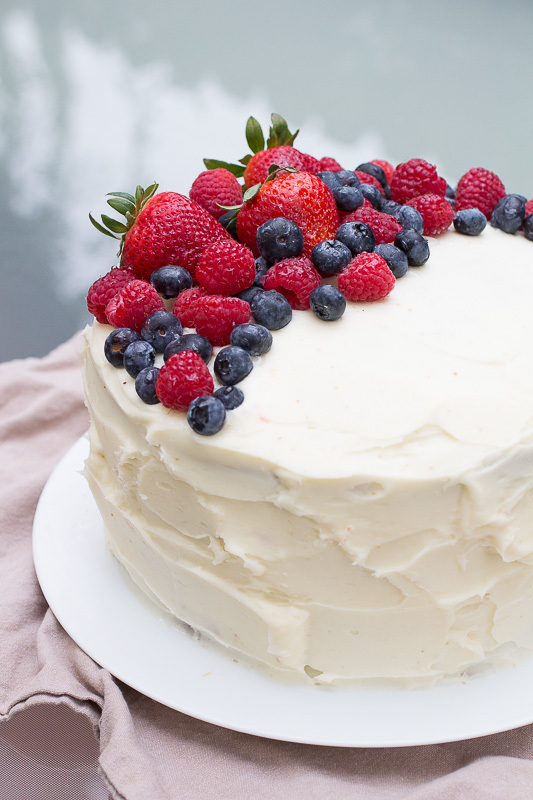 Ice the rest of the cake and garnish with fresh berries. Glaze the berries with simple syrup or apricot glaze (microwave for about 15 seconds, or until thin and pourable) and refrigerate until serving. For the 4 layers we just put the cake in 4 smaller pans or double the recipe? Hi! Just to clarify…bake the two 8″ cakes and then slice each of those in half to create 4 smaller layers correct? I’m not sure why I’m confused but there was so many notes about the layers that wasn’t clear so wanted to be sure. Thank you! Can’t wait to bake! How did you make the cupcakes? Were they layered as well? Difference in oven temp/ cook time? Any tips or a link to that recipe would be greatly appreciated. the cupcakes were not layered. Same temp, just a shorter baking time. I was actually planning on making these into cupcakes again within a day or so, so if you aren’t in a rush I will get back to you soon if there is something noteworthy! Hi there, I hope you reply soon but I’m making this cake and the ingredients call for 2 eggs but in the directions for the cake, it says “egg” not eggs twice so do I use one egg or two? Thanks !! do you apply the syrup then do your crumb coat and refrigerate? then take it out and put icing and berries and stack? What is a half stick of butter – 1/4 cup? I’m so sorry it didn’t work out for you. It does make a lot of frosting so I do suggest cutting the recipe in half. Thanks for the feedback. Thank you so much!! and thanks for the tip about the stars. always trying to get that 5er haha! Thanks for the recipe! But where do the water and vinegar in the cake part come in?? Also, can this be turned into a sheet cake? Thank you for noticing the mistake! I just updated the recipe. It goes with the wet ingredients. And it can definitely be made into a sheet cake! It’s a very versatile recipe. I’ve cut it in half, made it into cupcakes, and i’ve doubled it with no problem, as well. The baking time will vary a little, but not by much (Ultimately it would depend on the size of your pan). Let me know if you give it a try! Thanks, Sue! Your recipe is great! It came out moist and fluffy! I baked it all in a 9″ by 13″ pan and increased the baking time by 20 minutes (my oven may bake a tad on the low side). I brought it to work as a birthday surprise for a coworker and it got rave reviews all around. That’s amazing! I’m so glad it was such a success! Hi, when you say it can be made into cupcakes, how would you layer the fruit and frosting in? Hi Charmagne, I would just build it like a normal cupcake, and place the fruit on top. You could also cut the berries up into smaller pieces and fill the inside using a cupcake corer or angled pairing knife. Thanks so much for the response, Suzanne! Yes, totally forgot about the corer, brilliant! I wanted to make them a little more portable for Mother’s Day, and that will work perfectly! I also realized after the fact you could do fruit on top because your piping The icing on and not spreading like a cake. Great idea to make them for Mother’s Day! Let me know how they turn out! Should the sugar go with the dry (flour) ingredients – I’m used to sugar getting blended with wet ingredients so it gets blended. I’m surprised there’s no beating of the butter, sugar eggs at first! This cake is phenomenal and i cannot wait to try making it myself! What type of vinegar do you use, apple cider or just regular white vinegar? THANK YOU! And it’s just regular white distilled vinegar! Is the apricot glaze just for the fruit or does it go somewhere else in the cake as well? The glaze is just for the fruit, so if you don’t feel like buying that you can just use a simple syrup. It looks like you have blueberries in the cake as well as the strawberry jam. Yes you are right! The strawberry jam is mixed in with a simple syrup to keep the cake moist. It goes on top of each layer of the cake (but not the top). I learned this trick from a commenter who used to work at Whole Foods in New Orleans. Each layer is then filled with the Chantilly frosting and then a layer of fresh fruit! This is a perfect copy of the whole food cake made for a third of the cost. I think it is better because you can choose the berries of your preference. Thanks so much. Has anyone made the cake recipe in 3 cake pans instead of 2. The two layers were thick which was great but thought I would try to do 3 instead of cutting for a four layer? I am so glad you liked the recipe! And you can definitely do 3 cake pans instead of 2. I would just cut the baking time down, but otherwise it should work out beautifully! The Chantilly Cake at my Whole foods has a wonderful almond/marzipan flavor element to it as well. The outside edges are coated in sliced toasted almonds and the mascarpone frosting has some almond extract or marzipan in it. I may make a few slight alterations but I am absolutely going to try this recipe and use all your clever tricks! It’s just what I’ve been looking for! Thank you! Sliced almonds would look so elegant, and it would make the sides look much more uniform! It reminds me of a cake my dad used to get every year for his birthday years ago. I’m definitely going to do that next time! This cake is absolutely delicious; however, mine was no where near as pretty as yours. My frosting was too soft, but tasted delicious. Now I realize that what’s really important is that it tasted good, but I was hoping for a better presentation. Any tricks or ideas on what I did wrong with the frosting. I followed your recipe to the letter. I can’t wait to try again. I’m sorry your frosting didn’t set properly! Sometimes it can help to chill the frosting first, if you didn’t try that. I like to do a crumb coating first, and then refrigerate the entire cake, and then finish it off with another layer of frosting. But just t warn you, this recipe is a lighter frosting in general, so it’s never gonna set up the way a traditional buttercream would. I hope this helps! i can’t wait to make this for my husband’s birthday! How long would you say this cake stays fresh uncut. Could I make it Friday and serve it Sunday afternoon? Or any parts that I could make ahead of time? Also, in your first recipe you put almond extract in the icing. Did it turn out better without? I honestly don’t think it makes a big difference. I didn’t add it the second time because I made the cake at my sisters house and she only had vanilla. So it’s really up to you! I think I used almond extract because it’s listed on the ingredients at the store (although don’t quote me on this because i’m not positive that was the case.) Let me know what you end up deciding! In your recipe you don’t have vanilla in the icing… Should I put it? I’m sorry I realize my response was misleading. I meant she only had vanilla, so I didn’t add any at all. Unless you have clear extract, I wouldn’t add it for fear of adding a hint of color. Absolutely! It’s such a moist cake that it doesn’t dry out, so everything can be made ahead of time. I actually recommend making the icing at least a few hours in advance, and if made a day or two before, just let it sit out on the counter for a little while so it is manageable. The cake should keep in the fridge for about a week! Just make sure your berries are fresh. Let me know how it turns out! What temptemperature and for how long do you bake when making this recipein cupcakes? I like to preheat my oven to 350 and then reduce to 325 F. You can start by baking them for about 20 minutes, and then depending on your oven make a judgement call from there by testing if a skewer comes out dry. You can also lightly press down on the top of the cupcake and if it bounces back slightly it’s ready. If your baking time ends up being a little different let me know! Good luck! I’m not really sure if my icing turned out completely right. It’s kind of a more yellowish color and has a few chunks in it but I’m sure if I used a mixer the chunks would come out. I just don’t know if it’s rightmost how to fix it if it’s not. Any ideas? oh man ok that can possibly be fixable! It depends on how it’s chunky though. Like do you think it might be because the cream cheese was too cold? or the butter? If you haven’t put the whipped cream in yet, this can be definitely be fixed by letting it get room temp and mixing it more. If it looks like cottage cheese-y, then that would mean your whipped cream was over whipped and it broke, which wouldn’t really be fixable. yellowish usually means that the butter was too soft and or melty. Can you tell me exactly what you did? Did you not use a mixer when you made it originally? I didn’t have a mixer so I didn’t use one. And before I mixed anything I let everything sit out for like 10 minutes so they would get to room temperature. I mixed the whipped cream for 5 or 6 minutes, I wasn’t really sure what it looked like if it was over mixed or not. oh yes that’s definitely it. It’s very labor intensive when you don’t have a mixer. For that to work you would have to make sure that your butter, cream cheese and mascarpone are incredibly soft (like borderline too soft) when you mix that with the sugar. And then sacrifice some of the whipped cream by taking a scoop and mixing it normally, and then folding in the rest very gently with a spatula. And then after I would recommend refrigerating it first because it will be soft and difficult to work with. I’ve never actually made it without a mixer so I can’t say it will ever be exactly like my recipe but if your only option is to do it by hand than that would be my recommendation. My cake didn’t rise at all 🙁 I ended up making two batches of the cake so that I could get four layers. Any tips on how to get my cake to rise next time? Hey Amanda, i’m so sorry it didn’t rise that’s so strange! The cake pictured actually is 1.5 batches. (I made extra just to be safe and ended up making a few cupcakes on the side) Did the cake come out very dense or just not as tall as the one pictured? Was there a crater in the middle or was it even? There are many reasons that can cause a cake to not rise. Sometimes it can be the result of outdated baking powder/soda. A crater would mean that the oven was not hot enough, etc. The cake was quite dense, but it did keep the moisture! It didn’t crater after baking, the top was softly rounded. I did use generic Parkay baking stick margarine instead of real butter. Would using cake flour and real butter make it fluffier? The cake was still wonderful though! Great recipe! It’s my mother’s favorite cake, I made it for her birthday. She loved it! I can’t say that I am an expert on the subject, because I never bake with margarine myself. However, I do know that when baking cookies, margarine usually causes the cookies to spread out more when used over real butter. I thought this article was helpful http://www.glutenfreeclub.com/butter-margarine-in-baking/ (Sh here is what I think happened with your cake. Since the butter/margarine is intensionally melted, it was no longer able to hold air bubbles in the batter, which caused the cake to become dense instead of light and fluffy.) So I would definitely recommend real butter over margarine. As far as the type of flour to use, I would stick with regular all purpose because of the protein content. I haven’t tried using cake flour as an alternative with this recipe, but considering we almost exclusively used cake flour in school, that’s definitely an experiment I want to try out soon! I’m glad you still enjoyed the cake even though it didn’t turn out exactly as planned. Let me know how it turns out if you decide to make it again one day! Oh my goodness!!!! Thank you, thank you, thank you for posting this copycat recipe! This is my favorite cake in the whole world and I am so very happy I can “attempt” to make it at home 😉 I will be sure to come back and comment on my results! I do have one question though… I know in a previous comment you said you made it without the almond extract at one point and did not know the difference but if I wanted to use the almond extract how much would you suggest to start with? Wish I had read this comment before making my icing. The recipe clearly states 1 tsp of almond extract which is what I added. Now there is an overpowering almond flavor. Does it have to be buttermilk? Or can I substitute with something else? I cant wait to try this recipe! !! If you don’t have buttermilk, you can use regular milk and add extra white vinegar or lemon juice instead. I often do that when I’m making pancakes. I just enjoy working with buttermilk because it makes the cake extra moist, but it can be a bummer when you have a lot leftover and no use for it. Let me know how it goes and what you decide! Thank you for this! I made it for my mom’s birthday, and nobody could stop eating it. One person there doesn’t even eat dessert and he had two pieces! I used a bit of almond extract in the batter – not sure if it had any effect, but the cake itself was good. Your Welcome! I’m so glad it was a success! Hi! 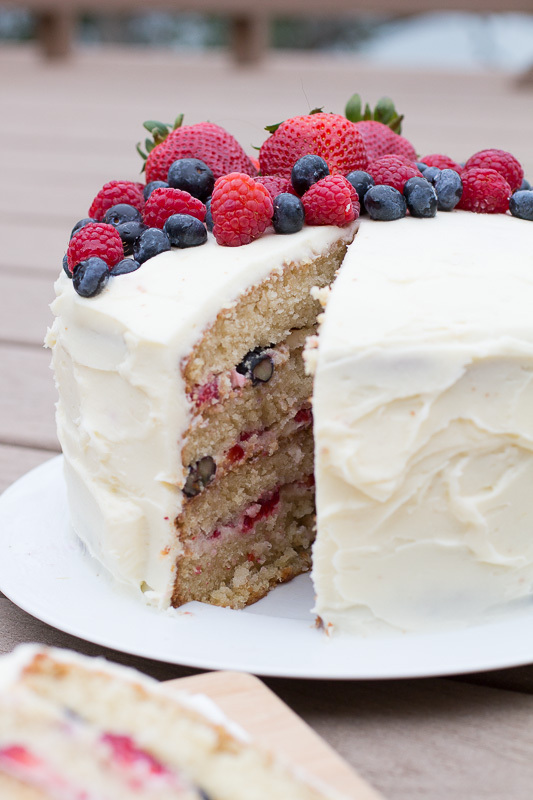 Do you glaze the berries before putting them in the cake layers or just the ones used for garnish? No, I only glaze the berries on top. Let me know how it goes! I JUST finished making it for my boyfriend and his family. It was beautiful and delicious! For the berry syrup, I used half of the sugar and added a bit of lime juice. Then I added almond Slivers to the sides. I’m so glad you liked it! I always end up with leftover frosting as well. I also usually double the cake recipe so I forgot to mention that it makes a lot. I’ll make a note that says the recipe can be cut in half. If I wanted to do a 13×9 layered cake, how much more ingredients would i need do you think? Should I double or triple the list? Hi Angela! I think you will be just fine with doubling the recipe. And if you are also planning on making the icing, you are safe with one batch. Let me know how it goes! Thank you so much for this wonderful recipe, I made this cake for my dad’s birthday and it was an absolute hit! Highly suggest! Do you have any suggestions for high altitude we live in Denver, Colorado. Hi, Summmer. I made this the day before I went camping with my sister. I stuck some skewers in it to be safe and we kept the cake in a cooler until we ate it that evening, and it was perfect. The frosting is very light, so you might want to decrease the amount of whipped cream just so it doesn’t slip and slide while you are transporting it (And unless you plan on doubling the cake recipe, which I did in the cake pictured, I recommend cutting the frosting recipe in half). You could also bake the cakes and make the frosting in advance and assemble the cake at their house if you are concerned about traveling. Let me know how it goes! Hi Suzie, what kind of flour do you recommend using? Thanks! Hi Jacqueline, I use regular all purpose! Let me know how it turns out. Do you decrease the oven temperature from 350 to 325 AFTER you have already placed the cake pans into the oven? Or do you wait until it has hit 325 to put them in the oven? Hi Christine, decrease the oven temp right before you put the cakes into the oven. It should still be about 350 when they are placed into the oven. Suzie, when you mix the wet into the dry ingredients do you just use a spatula or do you use a hand mixer to mix it? I’m so sorry it wasn’t what you expected! Did it come out rubbery? I usually just use a whisk or hand mixer and mix until it’s just incorporated. From what you described, it sounds like it could have been over mixed. In school we learned that over mixing can result in “tunneling” or holes throughout your cake. It also over develops the gluten, which makes the cake dense instead of light and airy. Of course this is just a hypothesis since I didn’t get to see your results first hand, but if you ever try it again, please let me know how it turns out! I’m bummed it didn’t work out. I am by no means a pastry chef but i do have a bit of experience baking and i love to experiment with new recipes. But I have never made a cake before using this method of melting the butter and only stirring the wet and dry ingredients together all at once. My cake too ended up dense and spongy with small holes. I figured the reason being that I stirred it together with a whisk and perhaps put too much air in it. I also found it to be very sweet. Almost too sweet. I haven’t assembled the cake yet, thank goodness. Now I know that it didn’t turn out right. I found a buttermilk vanilla cake recipe that I will use in place of this one. I will definitely use your frosting recipe. I spoke to the pastry chef at Whole Foods in Sugar Land, Texas this morning and she was saying that one of the key ingredients to add to the mascarpone frosting is 1.5 tbs of almond extract to get that almond taste. I just tried it using your recipe and it tastes amazing! Also, instead of strawberry jam, you can use 3 or 4 sliced strawberries with the water and sugar at very low heat and you have a natural jam in 5-10 minutes. Thank you for the recipe 🙂 made it for my brother’s birthday. I actually had almond extract in my original recipe, but I think I took it out of this one because I was at my sisters house at the time and she didn’t have any on hand. But I will definitely put it back in next time! I love getting the inside scoop. Thanks for the tip! My boyfriend asked for this cake for his birthday and I’m so thankful I found this recipe. It’s the most intricately constructed cake I’ve made but I know I can do it. I’m looking forward to seeing his face when he gets the birthday cake he asked for! Thanks!! Your welcome! and it’s even better because you made it yourself! let me know how it turns out. What a beautiful cake! I’ve often found cakes made with oil stay moist longer than all-butter, so your using 1/2 butter is an intriguing twist. My apologies if I overlooked your mentioning already…did you use unsalted or salted butter? I’m thinking of giving this a go tomorrow. Thanks! Thanks for pointing that out! I used unsalted and updated the recipe. Let me know how it turns out! Hi Susan, can I use flour cake?, I’m going to make the cake today for my husband birthday and I’m so excited to do it and a little nervous, thank you for posting this recipe we always get this cake at Wholefoods market, but this year I will definitely used your recipe. Thank you for taking the time to share!!!!!. Hi Maria, I have never tried using cake flour before, but I know there is a different level of hardness/protein content compared to regular all purpose. It’s already a pretty tender cake, so my fear is that the cake flour might make it too tender and it will have trouble staying together. If you only have cake, you can try adding a little more than the recipe calls for, but I’m not an expert on substitutions so I would do a little research first before making the switch. Let me know how it turns out! Can I cover this cake with fondant? It is a very moist cake with a very light and fluffy frosting. I think it would be a bit of a push, but if you do decide to give it a try, I would fill it with my frosting and mask it with either a buttercream or a 4:1 white chocolate ganache so it keeps it shape. I would probably exclude or use very little of the whipped cream from the frosting as well. You could even freeze the cake and wait for a little condensation to form before rolling out the fondant. It’s risky but I think it could work; especially since it’s still pretty cool out. If you were trying this in the summer I would say don’t even bother. Thank you for your response. Could you please give me recipe for 4:1 chocolate ganache. I have never made any ganache but definitely want to try white chocolate one. I am making a cake for my husband’s birthday and he likes white chocolate. sure! so 4 to 1 means you use 4 parts chocolate to 1 part cream (if you are using grocery store chips. This ratio can vary if you are using high quality white chocolate). So that would mean 4 cups of white chocolate with 1 cup of cream (which you can edit depending on the size of your cake). White chocolate can burn very quickly so I would melt it slowly over a double boiler and then bring your cream up to a simmer. When the chocolate is melted, remove it from the double boiler, then gently pour the cream into the melted chocolate. Whisk vigorously until incorporated. The ganache will thicken as it cools. If you put it on the cake too soon, it will melt off. If you put it on too late, it will be too difficult to pipe and spread out. Wait until it’s room temp, mixing occasionally. You can also pop it in the fridge, but only briefly, to speed up the cooling process. You want it to look thick but fluffy (if that makes sense). If it gets too cold, you can always place it on top of the double boiler briefly to warm it up a bit. Thank you so so much for your feedback. One last question what do you think if I put fondant made toppers like buildings and houses on ganache surface instead of fondant surface. Do people do that? Or does it look odd. I made buildings and houses with fondant. of course, any time! I’ve seen sugar flours on top of a fondant-less cake but I’m not sure if I’ve seen fondant sculptures – but that doesn’t mean it’s not possible! I feel like these days there aren’t any rules for how you can or cannot decorate a cake. Have you worked with fondant before? Because if you mask the cake with the ganache and it gets firm to the point where it’s almost solid, you should be fine to cover it with fondant. I used to live in new Orleans Louisiana and I loved this cake is fantastic unfortunately here in FL they don’t have it publix start selling them but in my opinion it has nothing to do with the one from whole foods Im pregnant and about to have my baby so I’m going to try to make it ASAP hopefully it comes out good I don’t have to much experience baking 🙂 thank you so much for the recipe !! your welcome! let me know how it goes and congratulations! While this recipe looks absolutely amazing, one of the things that makes the WF Chantilly cake so unique is the flavor of almond, which I don’t see in this recipe… Is the almond flavor a new thing as I have just tried the cake for the first time this week? I’ve dabbled with using almond extract in the frosting and you could definitely sub it for the vanilla in the cake as well! This cake recipe did not turn out. I’m an avid baker and followed the directions exactly. 1.5 recipe in two standard 8″ cake pans. Baking took 55 mins to cook. The top is sunken in and hard on top. Very frustrating. I’m so sorry it didn’t work out for you. I went back and took a look at the recipe to see what might have went wrong. I find that this webpage has very helpful tips regarding sunken cakes: http://www.craftsy.com/blog/2014/09/how-to-keep-a-cake-from-falling/. I’m also going to test out the recipe again myself and see what I can do to prevent this from occurring again. Thanks for the feedback! Any chance you know how many cups of cake batter this recipe makes? i made this cake yesterday and it is absolutely delicious..Thank you for sharing this..
I’m so glad you enjoyed it! Thank you for the positive feedback! Hi Suzie, thank you for sharing your recipe with all of us! I have tried to bake it twice and it seems to come out less fluffy and overly moist. I mixed the wet ingredients with a hand mixer just until combined. Do you know of anything else I should try? I’m determined :-). Thanks again! Addition to my earlier post; as an example, if I pinch a piece of the inside, it binds together like clay; under cooked? The top is shiny as well. I do use a moist wrap around each pan so I wonder if this could cause under cooking? Thanks again! Hi Kathy! Thank you for the background info, and I appreciate your diligence! I would say definitely bake it for longer, and to make sure your cake tester comes out completely dry before removing it from the oven. I also do not use a moist wrap. It’s never worked for me personally and I feel like it would create steam which would add additional moisture to the cake. It is a relatively moist cake in general, so hopefully these tweaks will make you successful in your next attempt! Thank you for sharing your recipe with all of us. I made this cake and it is wonderful! I’m glad it was finally a success! Thank you for your feedback! Can you please tell me how to glaze the berries on top? Do you add them to the glaze first and then add them to the top of the cake?? I arrange the berries on top and then gently brush them with the glaze. If you don’t have a brush you can also gently spoon a small amount of the glaze on top. Just don’t put too much. A little goes a long way. Hope this helps! I’ve been testing out a couple berry chantilly cake recipes and this one is definitely my favorite so far! Thank you! I added almond in the frosting instead of vanilla and it tastes great! This might be a weird questions but when making this cake did you ever have the inside of the cake turn out a little blue in the cake layers? It looks that way where the syrup is in the cake. I followed the ingredients using raspberry preserves instead and it was a red color when I applied onto cake but when I cut it the day after making the cake, it was blue? It still tastes good but I’m making this for a baby shower and don’t want to freak anyone out haha. Hmm I have actually never experienced that. That’s very strange. The only time I’ve ever had something change colors is at work when we put lemon zest in something prematurely and it turns green. Just out of curiosity, what brand of preserves did you use? I can ask my chef about this at work tomorrow because it’s very peculiar. I’m so glad the cake turned out well overall, though! Thanks for getting back to me! I just used the regular Smuckers brand. Maybe I should try using a different brand this time around. I was just curious, thanks! I had this cake from Whole Foods last weekend and fell in LOVE! Ate two whole pieces and didn’t feel a bit of shame! Wow, what a cake! I’m happy to have found your recipe and also for so many comments and tips! I’ve only ever baked one cake from scratch and would ultimately be making this is for a birthday in about 10 days, so I’m a little nervous. I’m thinking about doing a trial run this weekend with a small round version and then doing a sheet cake (so I have room to write) a day or two before the party. If I am doing a sheet cake (9×13) and want 4 layers, how many times should I increase the recipe? By 1.5 or doubled or 2.5? Thank you for doing the homework and sharing this recipe! Hi Cindy! I’m honestly not sure, but I would say double the recipe. I would definitely give it a trial run this weekend and then you should be able to gage how much you will need for the 4 layers. I would also suggest going straight to the sheet pan during your trial run because things like baking time will vary. Are you planning on baking off each layer separately or cutting it in half? Because the cake is quite tender, so I’m afraid it may break in half if you try and cut it. You could potentially freeze it, but it would take a lot of finesse (and a little bit of luck) to prevent the cake from falling apart. Thank you for your quick reply! Good idea on practicing with the sheet cake – might be tonight as I’m excited to try this! I’ll definitely heed your warning and not try to cut the sheet cake into layers. I’ll bake them (3 or 4) individually. Will the cake batter survive the time or should I get a couple more pans? Also, I found the answer to the flour — that if it doesn’t specify a type, then it means AP. Thanks again! Hi again! I finished my trial run cake last night which will be eaten mostly by my “testers” — my co-workers! 🙂 Am I ever glad I did a trial run! I learned so much!!! Let’s see…..the time from starting to finished product takes a LOT longer than I expected — from getting ingredients together, leaving the butter and cream cheese out to get soft, preparing the cake batter, the fresh fruit and the frosting, cooling the cakes completely, assembly, frosting the cake, etc. I did 1.5x the recipe and used 10 inch round pans. My layers were about 1-1.5 inches thick, and I don’t know if I should double the batter next time. Compared to the Whole Foods cake I had last weekend, I definitely need to either do 1.5 or 2x on the frosting (remember I did 10″), and I definitely need to double the fruit in the layers. I was afraid to use too much of the syrup in between layers and I won’t make that mistake again. I need to make the apricot glaze thinner and figure out a way to get just a very little on the fruit — I’m thinking an eyedropper type thing. I have not eaten a whole piece yet — just one bite — and I’m not sure I’m crazy about the almond extract flavor. Anyway, it was all a learning process and the end result really was a very pretty cake (that I hope will taste great to everybody when I make it again next week) and I’m so grateful that you took the time to put this recipe together. Question for you — on your fruit for the layers, how much do you use? And, do you slice all of it — or just the strawberries? Oh! Also, I used a wrap on one of the pans and not on the other. They both turned out identical, so I won’t waste time with that next time. I did try a trick I found online — for any hump (and I had just a tiny bit of one), using a towel, gently press the hump down on the completely baked cake right when it comes out of the oven. I did this and both of my cakes were then completely flat and uniform. Hi Cindy! Thank you so much for all of the feedback and I’m glad that the recipe worked out for you. When I’m in doubt about whether I should double a recipe a not, I always do and then use the remaining batter for cupcakes or scraps for snacking or cake balls. When I glaze my fruit, I use a pastry brush. I also thin the apricot glaze with a splash of water and microwave it for about 15 seconds or so. I’ve also had mixed feelings about the almond flavor, and have tried both. You could definitely just use less, sub for vanilla or use nothing at all if that is what you prefer. Also, a tip about leaving out butter and cream cheese – being patient and doing it the natural way is great, but also time consuming (especially if it’s chilly out). You can always pop them in the microwave. With butter, I place the wrapped stick in the microwave on a plate and cook for 4-5 second intervals, turning the butter one rotation as I go. After 4 – 5 times rotating (feeling it as you go) it should be room temp. The cream cheese is less sensitive and doesn’t require the stop and go. 10 – 15 seconds or so and it should be ready. Regarding the fruit, I try and pack as much fruit in there as possible while still leaving a small space around the edge so they don’t ooze out when I stack the layers. And depending on what fruit I use, I will break apart larger berries like blackberries but keep other ones whole like rasp and blue. Although if I don’t have enough of the more expensive berries, then I break them up so there is enough to go around. I hope this helps! It absolutely helps — a ton! Thank you! I just purchased a pastry brush set and an icing spatula online. Thanks for everything! I’ll let you know how the next one turns out! of course! I look forward to hearing how it goes! Cindy-since you made the cake twice, do you have any suggestions for me. Should I make 1 ½ times the recipe? I will make 1 ½ times the frosting!! I made 1.5 times the cake and I thought my layers were just the right size. But, because I made 10″ cakes, I had to frost a bit more cake and the consensus — from myself, my significant other, and four co-workers — is that it definitely needed more fruit AND more frosting. So next time, I am doubling the frosting. Cindy- how much fruit did you use and what amounts of fruit would you use next time you make the cake? I used a standard small container of strawberries, blackberries, raspberries, and blueberries, from the grocery store. I think the containers are a pint. Maybe a little more for the strawberries. It made a nice thin layer on each of the layers, plus I had some leftover for the top of my cake. I also cut the larger blueberries, raspberries, and blackberries in half so they did not cause too much bulk. Having had the whole foods cake just a week before, I know that the fruit is a big part of what really makes this cake, so I will not hesitate to add double next time. Also, on the flour, is that AP flour, or cake flour, please? Has anyone made this using GF flour? Just wondering if it would work and turn out as well making it gluten-free. Thanks! Hi Amy! I haven’t tried making this particular cake gluten free, but I have had a lot of success with the king arthur gluten free flour brand with other recipes. It’s a bit expensive but definitely a great product. a couple minutes after folding the two frosting mixtures together, it seemed to curdle…boo hoo. What have I done wrong?? My cake is a flop!! Hi Lori, I’m sorry it doesn’t come out right. It can definitely be tricky. It sounds like you over whipped the heavy cream. It also helps to take a heaping scoop of the whipped cream, mix it in well with the cream cheese mixture (this is called sacrificing because it looses some volume) and then folding in the rest gently. Hi, Thank you for the recipe! Is the apricot glaze used for the fruit on top of the cake? Yes, it’s just for the fruit on top of the cake. Hi Sue! I’ve been raving about this recipe and am here to get the link to send to a friend; and thought I’d post a note. I made this the second time for the birthday party about a week ago and it was a HIT! The birthday guy from two weeks prior (where I had the Whole Foods cake) said it has more flavor than Whole Foods’s cake! I made two 10″ round cakes and had 4 layers. I did 1.5x the recipe for the cake. I used vanilla instead of the almond in the cake, but I didn’t notice it any more than I noticed the almond last time. Since I had extra raspberries, I made a fresh raspberry puree (rather than the preserves I used last time) to brush on each layer of cake right before the icing. I doubled the fruit from the amount I used last time. I cut all larger pieces of fruit (even blueberries) and blanketed the layers so hardly any cake showed through. Including the pretty fruits left for the top, it came to well over a full pint of each fruit – blueberries, strawberries, raspberries and blackberries. I doubled the icing. Like you suggested at the top, I halved the mascarpone and doubled the heavy whipping cream. I used half of the almond extract in the icing, but don’t think I’d notice if it wasn’t there at all. I think next time I’m going to try to use half the butter and see how that works. Your suggestion to do a crumb layer of icing and put the cake in the freezer for a bit was a huge help! Made the rest of the icing job much easier, smoother, and crumb-less. Finally, I bought a little set of pastry brushes! I made the apricot preserves thinner than last time and, with the brush application, it looked like a professional job! I had about 40 pieces of fruits on top and used, at most, a teaspoon of apricot preserves. This is the BEST and freshest cake ever! Thank you, Sue — for the recipe, and for your quick and thoughtful comment replies! Of course, and thank you so much for your feedback! You really made my day! I’m so glad the cake was a success. I also love your idea to do the fresh puree. Fresh is always best, and I bet it was a nice consistency as well. And I can’t believe he thought yours was better than the original, that’s quite the accomplishment! I made your cake two years ago and I am asked to make I again for my wife’s birthday. It was wonderful back then and am looking forward to it again this year! My only concern when I made it the first time was that it was a bit more dense than it sounds like it should have been, I am wondering if this is because of the altitude. I live in Denver and the altitude always messes with everything. I have had luck in the past with baked goods when decreasing oil and sugar a bit, increasing egg and liquids, increasing baking temp and decreasing bake time. I didn’t want to mess with the recipe too much since I am not that familiar with it yet and have only made the cake one time. So, I thought you might have some recommendations for any adjustments that could help to offset the negative side effects of baking a mile high. Thanks for your help! Unfortunately I don’t know much about baking in high altitudes because I’ve never done it before. But it sounds like you have had success with adjustments in the past, so I’m sure if you do the same you might have similar results. I feel like you might have the best luck with increasing the baking temp perhaps since it directly affects the leavening agents in the cake and helps the cake rise and set faster at a higher temperature, but otherwise I’m not sure what adjustments you could make without affecting the recipe itself. Let me know how it turns out! THANK YOU so much for this recipe! I have my own home cake/cupcake business and have always struggled with a good homemade vanilla cake. I have tried countless recipes including making my own but they were always not fluffy, flavorful, or moist enough. I thought I’d have to settle for my mediocre recipe until I found yours! It’s everything…flavorful, super moist, and fluffy. My clients rave about it every time and I’ve made it more times than I can count. The search is over! Very versatile as well bc you can make other flavors with it such as lemon…doing that this weekend for my parents anniversary. Makes a great cinnamon, cookies and cream, coconut cake/cupcakes too! One question though…do you think I could substitute the eggs for 4 egg whites to make a white cake? Thank you! Of course! I’m so glad it has been such a success for you. I wish I could start my own cake business! And I have never tried the egg white thing, but it never hurts to give it a try! Let me know how it turns out if you do. I made this and the cake was super moist and the icing to die for. If I made again I would eliminate the berry syrup as it made the layers really soggy. It was moist enough on its own. Still a keeper. I agree Marcy, I also tend to exclude the berry syrup as well because the cake is already so moist. A Reader who worked at whole food mentioned they always use a syrup so I figured I would add it to keep it a true “copycat”. Thanks for you feedback! Every year we’ve done Whole Foods Chantilly cake with Marscapone frosting & berries for my daughters birthday. We just moved to rural area where we’d have had to drive 2 hours each way to keep that tradition. Thank you so much for sharing this recipe, it was delightful & just the way we remembered it! Thanks for helping us keep the tradition alive! I did have a bit of a problem with the cake melting though (we live near a rainforest, it’s a very humid environment). It wasn’t out of the refrigerator long but it didn’t melt until after the candles & cutting of the cake. I will definitely be making this cake again next year! It’s light, fluffy, moist, tasty, & super simple. However I think next year I will omit the whipping cream from the frosting. I made the frosting the day before & I can’t help but wonder if the whipping cream was separating & thats why it melted? Thanks again for the recipe! You saved our family tradition!!! When I made the cake for my sister when we went camping, I drastically reduced the amount of whipped cream. I have made the frosting a day in advance before and didn’t have a problem with it separating so I think it’s related to your environment. It doesn’t hold up well to warmer temperatures with the normal amount of whipped cream, but it is equally as delicious without it. So I took this recipe and cooked in a camper oven in the outdoors. This recipe worked amazingly. I had to keep things on ice, OH MY GOSH people were amazed. Thanks for this recipe its a keeper! That is amazing and I’m so glad it worked in that environment! I know people have had issues with temperature control in the past so i’m psyched it worked so well for you. My daughters and i do not bake often and thought this would be a great 4th of july cake….we love chantilly cakes! When you whip the whipping cream how do you know a firm peak? Do i just whip the cream to make the homemade whipped cream? I know to add the other mixture in but just confirming. Can’t wait to see how it comes out. Hi, yes you whip just like a normal whipped cream. You want it stiff enough so it doesn’t flop over, but not so much so that it looks grainy that it looks grainy. Whether you are doing it by hand or with a mixer, I like to go just before it gets to that point and then finish it by hand. Just a few turns of the whisk can take it too far. I just made this after tasting Rouses grocery store Gentilly chantilly cake . My friend told me I had to eat this cake.It was so good I had to make it!!! Looked up recipes looking for a chantilly cake and came across yours ..read the recipe twice made the grocery list my husband got the ingredients and went to town on making it !!! Omg I gotta tell you it was delicious …perfect…to your recipe. I also did not use a mixer for the cake part but used it for icing . Followed the recipe to a “T” it was a joy to taste the perfection in this recipe . Will definitely make again for special occasions or just because. My husband said this was the best!!!!! Thank you so much for the positive feedback Jeanne! I’m so glad the cake was a success! I think this recipe is a little confusing as written. I wish both the cake and the frosting recipes were for the same amount. I ended up with quite a bit of frosting and my 2 cakes were not tall enough to cut in half. I also wish I added a more fruit between the cakes, I would have also arranged the fruit so there is no cake that shows through. I thought the jam was very unnecessary and provides an artificial taste compared to the fresh fruit. I would just use a simple syrup next time. I also avoided the apricot syrup because again why have more sugar and preservatives when you can just have the natural fruit? Thank you for the feedback Joyce! You make a very good point about the two recipes not matching in quantity. I do mention to consider cutting the frosting recipe in half, but you are absolutely right; The recipe really should be intended to be made as written. I will have to make this cake again soon and update the qualities so the recipe is more balanced. As far as the apricot glaze goes, it’s definitely not required. It’s just a habit us pastry chefs have when it comes to fresh fruit on top of anything. It makes them shiny and prevents them from drying out. Thanks so much for this! Joyce, what a coincidence that I made this cake (for the third time) last night! I believe most of us that are using this particular recipe are trying to to re-create as closely as possible Whole Foods’ version of this cake. 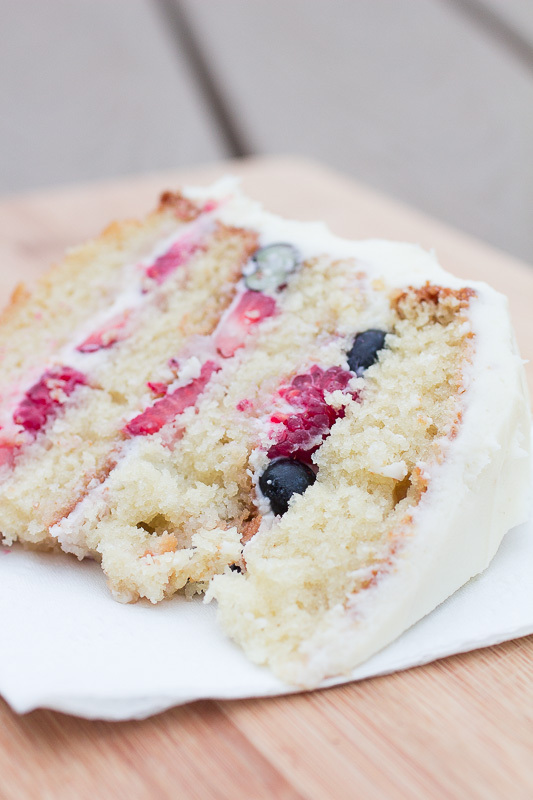 I agree with you that sliced berries should cover nearly even square centimeter on the cake layers. The last two times I made it, I made a very simple raspberry puree from scratch and I think it does a good job of adding that extra moisture between the layers that the Whole Foods version has. On the apricot glaze — that is what gives the fruit it’s polished shine and that is how Whole Foods presents the Chantilly cake. I think it is pretty and it takes a mere fraction of a teaspoon of jam to glaze a ton of fruit on top of the cake, so added sugar is nominal. I used my own yellow cake recipe, and only made the frosting with the almond included. Everyone at work loved it, and someone even said she liked it better than the one at Whole Foods. This has now become MY FAVORITE frosting/filling for cakes. I will make it again in January for my birthday celebration. Thank you very much! I’m so glad it was a success! Thank you so much for the feedback! And I can’t believe she liked it more than the whole foods version. Made my day! You’re welcome Suzanne. Job well done! Just wondering what you mean by your own yellow cake recipe?? Please excuse the late response. I doctored up a DH butter cake mix. Hi!! I love this cake and have made it SO many times, in fact I am making it for a friend’s wedding next weekend! Do you happen to know about how many cupcakes the standard recipe would make? I haven’t made cupcakes in some time but if I remember correctly I think it was a little over 24. If you give it a try let me know and I’ll update the info in the recipe! Good luck! Do you think frosting would be too soft to put in a frosting bag? Do you suggest putting in fridge first? It is on the softer side but you can reduce the amount of whipped cream and it will hold up better. I would definitely suggest refrigerating first if you plan on using a piping bag. I’ve used it in a piping bag before and it worked just fine. Hi Sue…I was looking for any comments about the amount of berries to cut up for the layers but there aren’t any. How much did you use for the layers? Hi Paige, it’s really up to you but I think I bought a carton of strawberries, pint of blueberries, and half pint of raspberries…Ends up being how much you want to spend bc berries are $$$, but the more the merrier! 🙂 I just pick out the prettiest ones for the top and then evenly distribute the rest between the layers. I’m making this for a wedding shower this weekend. I plan to double the cake recipe because the hostess wants a rectangle cake and I want to be able to have a few layers. For cost effectiveness, I was considering buying a pint each of fresh berries and using frozen along with the fresh between each layer to be sure I covered the entire layer with fruit. How damaging do you think that would be to the integrity of the cake? I hope this isn’t too late but I would avoid using frozen berries for this particular cake. They tend to be extra juicy when they defrost which can add too much moisture. The cake is already quite moist as is, so it might make the cake too soft. If you really want to give it a try I would suggest defrosting and draining the berries first. sorry that must have been a typo. It’s both eggs. I’m going to make this cake for Christmas in a 9×13 pan (we’re traveling a long way). Am I understanding from the previous comments that I need 1.5 recipes for the cake if making in a 9×13? And by decreasing the amount of cream the frosting will be denser? Last, are the baking degrees the same for the 9×13, adjusting only the time? Thank you! Hi Bonnie. Yes to all three. If it’s easier, you can just double the recipe and make cupcakes with whatever you have left. The baking temp will be the same and exactly as you said, just adjust the baking time. Do you know how many cupcakes this recipe would yield? 1) Assuming all the cakes rise to perfection, do you think 3 filled & iced layers will be a good presentation height or do I need 4? 2) What recipe amount (regular, 1.5x or some other amount) will be adequate for each 1 inch layer? Thanks for you reply, Suzanne. I was leaning toward 3 layers as well. I liked the frosting, but did not care for the cake at all – it was way too dense. Tasted good, but definitely not a Chantilly cake. The Whole Foods cake is a much lighter color, like an Angel Food. This cake mix turned out yellowish in color and very dense and heavy. I’m sorry it wasn’t what you expected. Glad you at least enjoyed the frosting! That is strange. I’ve made this recipe at least a dozen times by now and it always comes out similar texture as the whole foods Chantilly cake. However keep in mind that whole foods does not bake them from scratch but rather a cake mix and you can never 100% replicate the texture of a box cake mix. I wonder if you are using an all purpose flour that has a higher protein content which causes density. Some brands have more protein than others. I like using Martha White. Also not all large eggs are the same size. I like using the store brand large eggs for baking bc they are usually a little bigger and yield a fluffier, softer cake in my experience. Hi Suzanne. I am planning on making this cake for a baby shower. We are thinking about doing a 2 tiered cake that are 6″ and 8″. Do you think I will be able to do a 2 tiered cake with this recipe? I was thinking maybe crumb coating it first then stacking it. Then finish icing it. Would I also need to double the cake recipe and what about the frosting? Can’t wait to try it out!!! If you did a 2 tiered cake, I would highly suggest using a cardboard cake round and dowels or straws to support the second tier. It’s a very moist and tender cake so any additional weight on top will cause the delicious fruit layers to seep out. As for how many times you need to multiply the recipe, it does depend on how many layers of each cake you plan to make. However, I think you will be just fine with x2. People always say there is a ton of icing left (and I agree) so start with just the original amount. You can always make more, and it’s a bummer to toss what you don’t use. This recipe is perfect! Thank you! I’m just curious how it would do if 4 egg whites were used instead of 2 whole eggs to make it a white cake. What do you think? Hmm. I honestly couldn’t say because I’ve never tried making a substitution like that with a recipe before but it’s worth giving a shot since it’s such an easy cake. let me know how it turns out if you try it!! I just tried making this cake and I’m not sure what went wrong. The cake came out pretty dense, didn’t rise & had some liquid rolling around on the top (looked like oil) even though the toothpick came out clean. When you make the batter, is it meant to look thin? Hi Elizabeth, those are some very bizarre results. The batter is on the thinner side; note thick like a pound cake batter. It sounds like something might not have emulsified properly which probably caused some fat to separate. Maybe the butter got too cold which cause it to clump up perhaps? In which case you would have pockets of solid butter throughout your cake that melted (great for a biscuit, not great for a cake). It is also possible your leavener has expired. I’m so sorry it didn’t work out for you. That is so amazing to hear! I’m so glad it was such a success! Thank you so much for this recipe. I’m going to try it next week, for my own birthday! I once ordered a “strawberry shortcake” cake from WF but they made an error and made me a Chantilly cake instead. We didn’t realize the mistake until we got home and sliced into it. But it was okay b/c the Chantilly cake was delicious anyway and I’ve always wanted to learn how to make it. Have you tried WF’s strawberry shortcake cake? Would you consider doing a copycat recipe for that one also? I really like the texture of their yellow cake and haven’t found any that compares (although, I’m kind of embarrassed to sing such high praises for a grocery store cake…hehe…) Again, thanks! I made the cake yesterday and served it today. The icing is simply wonderful – the best that I ever made. The cake was not a pretty color but delicious. I think the color was off because I used unbleached flour. Everybody loved this cake. Thank you for this wonderful recipe. After spending about a week trying to decide whether to make this reading the recipe over and over, I finally went for it tonight and I have to say it turned out better than I thought I’d be able to pull off, it was pretty damn good! Only major thing I’d say is that it does seem to be overly sweet…even though I used like 2/3 the recommended sugar for the chantilly frosting it was still too sweet. I probably will only do about 1 1/3 c sugar next time…no idea why it needs 3! But that aside the recipe is pretty close to perfect. Thanks a bunch! Can I make the layers and the frosting up ahead of time and assemble later? It would be 2 days prior to assembly and 3 days prior to the event. In other words, can I make the cake and icing on a wed night and assemble on a friday night for a sat brunch time event? Also I am planning on making 2 sheet pans (12x17x1). Ok, so i think they are probably more like cookie sheets with sides, but I have used them in the past with boxed cake mix (heresy i know) and it has turned out fine. From previous posts it looks like I should probably double the recipe for batter. Any tips? That should be fine. You could also freeze the baked cakes (wrap aggressively in plastic wrap and let defrost IN the plastic wrap so you don’t get condensation on the cake itself) and take it out Friday. You’d be surprised how many cakes are frozen in professional bakeries (i.e most of them!) I would also put the frosting in an airtight container. You don’t want it absorbing any unwanted flavors from your fridge. Suzanne, I am making this cake again on Saturday. While my first cake was really good I did not like the color. It was too pale. I was wondering if the color was pale because I used unbleached flour. Also, my eggs were rather small. I was hoping to have a crumbly more lighter cake but it was a little dense but still good. Finally, my the bottom of my layers were too light – what did I do wrong? Hmm. I’m not quite sure what you mean by lighter; lighter in color? were they not baked fully? And I’m not positive about the color either but the flour could have contributed as well as the eggs. I generally use large eggs whenever I bake for consistency. As far as density goes you could also be over mixing perhaps? Or your leavening could be out of date. Let me know how your second try turns out! Hello. So is there any way you could advise me how much to tweak this icing recipe if will be siting out? My son is having a birthday party, and he likes vanilla cake and fruit and not super sweet icing. I would need the icing to be a bit thicker for decorating and transport. You mentioned reducing cream. Sorry if I overlooked it, but how much would you recommend and is there anything I would need to add to make up for less cream? I have never attempted this kind of icing. I usually try a simple buttercream with shortening. And is it okay to sit out for 2-3 hours in an air conditioned area? Could this be done with 9″ pans? I have 3 nine inch pans and I don’t really want to go out and buy more. Could I keep the receipe the same? I’m so happy to find this recipe. Our Whole foods Market closed, and it’s only a matter of time before they all close, due to Amazon buying them out. i can’t imagine going without this cake, i’m going tomato t this weekend now that the fresh berries are in season. Thank you so much for posting! Such a good point Theresa! Let me know how it turns out! I’m curious how many servings this recipe makes. I’m trying to decide if I need to 1.5 it. Will I have enough frosting if I 1.5 the cake and half the frosting? It really depends on how much frosting you like. Personally, all of the ingredients for the frosting are ingredients I wouldn’t be using again for something else, so I would probably just make all of it. But you can easily make half, and make a second batch if need be (it’s pretty easy). A lot of my comments have mentioned that they have a lot extra so it’s really a matter of preference. This came out delicious! I made it for my mother-in-law’s birthday. She has tried the Whole Foods version and wanted that but I offered to make a homemade version after finding this recipe and I’m glad I did. I found the cake itself very tasty and also quite dense and moist. I may try a sponge cake next time I do this (but keep the berry syrup, frosting, and berries the same!). It was an easy batter and I made 1.5 batches as suggested. The batter filled two 9″ pans well with nothing leftover and the cakes weren’t especially tall but definitely tall enough to split in half for four layers. I made the frosting just as directed and it was delicious and the perfect amount for a four-layer cake. I used a pint each of blueberries, raspberries, and blackberries, plus a pound of strawberries. It was the right amount of berries even after I had to throw a few mushy strawberries away. I tried to copy the pretty half-moon design you used but next time I will just pile the berries on top as I saw on another recipe because mine was not as pretty as yours. My frosting had a few small lumps, which I think is because I forgot to warm the butter when I took the cream cheese and mascarpone out. I started with a frozen stick and chopped it up and warmed it but there were probably still some cold bits that didn’t mix well (I was rushing to get it assembled). This is a huge cake and four of us ate less than a quarter of it. Looking forward to leftovers when we have an occasion to unfreeze some! One more note is that I would assemble this at least a few hours ahead so it can really firm up in the fridge. I wish I’d put mine together the night before. Thanks for this recipe it was really wonderful and an impressive presentation! Thank you for the wonderful review! I’m so glad you enjoyed it! Soooooo… if I want a two layer cake, using 8 inch pans, do I have to increase the recipe? Or just follow as is? I’m a little confused. Why would there be a need to 1.5x a recipe? I’m wanting to do 3, 10″ layers. Do you think I could mix 2 1/2 X the ingredients to achieve this? After putting all the wet ingredients in the bowl do you mix them together or just put them in the bowl and then add to the dry ingredients? How do you adjust for altitude? Can this be made as a sheet cake? Also what about high altitude adjustments if any? Found this recipe one year for my moms birthday and it was a huge success. Although the first time took me forever to get the recipe correct, now I know the recipe by heart. Defiantly worth trying if you love to bake. Absolutely love the recipe. My only problem was the frosting, it was really soft. I will definitely make again! This is the most updated recipe, however, I have been doing things slightly differently so I will likely post another 3.0 soon (the ingredients being the same). The only thing I do differently now is I add half of the wet ingredients to the dry to form a sort of paste and slowly add the remaining wet – doing it this wet has reduced the amount of air bubbles I think some people are having with their cakes.